The structure “Tannur” was established after the renovation of an old residential building. The Arabic name “Tannur”, which translated means “oven”, is derived from the discovery, during the construction, of an old wood oven, carefully restored and enhanced and it is visible in one of the rooms. The structure consists of five rooms all with balcony or terrace and a terrace equipped which offers a wonderful view of the Gulf of Castellammare. 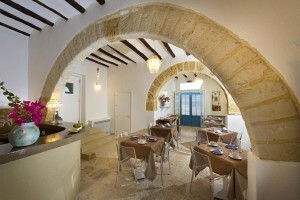 The style is typically Mediterranean, each room is characterized by its own color and custom furnitures. The materials used are the result of long and patient collection of original Sicilian maioliche used in a unique way and the floors made of old “Balate” slabs of travertine and the resin cement. The colors are those of Mediterranean architecture from the white walls to blue windows to sand-colored floors. Since early morning, the breakfast buffet is characterized by the typical flavors and fragrances of Sicilian products, and it customizes and inebriates the guests’ stay. The products, from the salty to the sweet, daily changed, are all locally produced. From the “pane cunzatu”(bread with extra virgin olive oil, salt, tomato, cheese and anchovies) to “arancini” to “cassatelle” and to finish the granita to be consumed whith brioches and with fresh fruit of the season; these are only examples of what the structure wants to offer of the Sicilian taste. In our hotel guests will find a family atmosphere that will shorten the distance from their homes.